AX MURDER (LICATA FAMILY). 1707 5th AVENUE. Call received at Police Station by Officer Tom Rigdon at 11:45 A.M. that none of the members of the family that lived at 1707 5th Avenue had been seen to come out of the house all morning. This call was received from 1709 5th Avenue and the caller stated that they had heard a peculiar noise about midnight. Officer Bell and myself answered the call in the Police Call Car. Upon arriving there we asked the neighbors at 1709 what the trouble was. They related to us about the noise they heard about midnight, but did not realize what it was. We then went to the side of the house, 1707 and called for Victor Licata and there was no answer. Then we tried to go in the back door, which was latched from the inside. The screen window to the right of the door was unfastened and the window was up. I climbed thru the window by using a ladder, nearby – unlatched the door and Officer Bell came in with me. We then went into the bath-room by opening door to same and found Victor Licata sitting in the chair with his hands to his head. We then asked him ‘what was the matter,’ and he did not answer. I went into the hall after the sister of Mrs. Licata had screamed and discovered there had been murder. I saw then in the rear bed-room, Mrs. Licata dead and her son, Phillip, 18, at her side in bed, still alive. I examined Mrs. Licata and found that she had been killed with some sharp instrument. Then I went into the center bed-room and found the daughter, Providence age 22 and the little son, Joe age 8 lying in bed apparently had been killed with the same instrument. Then I proceeded to examine the front bed-room and found Mike Licata, the father lying there dead on the floor, who had fallen off the bed also killed with the same instrument. I instructed one of the relatives to call the Ambulance to send Phillip to hospital. Bell – during this time had the prisoner in his custody. Deputy sheriff Ben Watkins assisted Bell and they took the prisoner, Victor Licata to the county Jail. F.T. Blounte ambulance picked up Phillip and carried him to the Municipal hospital, while J. L. Reeds with the assistance of B. Marion Reeds carried the 4 bodies to J.L. Reeds morgue. The following officers investigated: Sheriff’s Officer, City Officers, Bush, McMorris, Blanton, Mansfield, Dunn, Story, Beasley, Latture, Haskins, Vance & Yates. Here, let us once more go over the Police report, and see how it fit’s together with the other evidence against Victor. 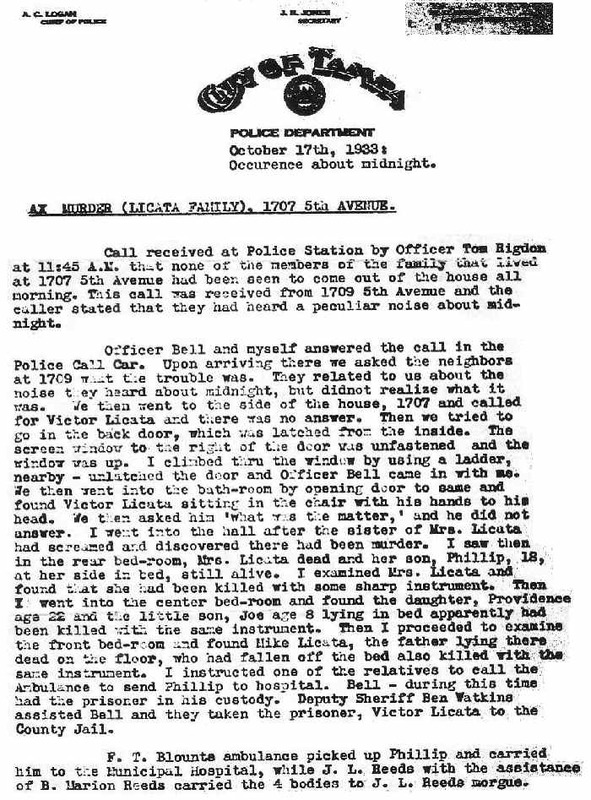 Note that the call to the police came in about 11:45 AM (Oct 17, 1933), but that the neighbors (who were related to the Licata’s heard strange noises around Midnight. This information will be used in another chapter to create a time line of events. Officer Bell and myself answered the call in the Police Call Car. Upon arriving there we asked the neighbors at 1709 what the trouble was. They related to us about the noise they heard about midnight, but did not realize what it was. We then went to the side of the house, 1707 and called for Victor Licata and there was no answer. While this could just be an, English language quark, on the part of a hurried reports writer, --- STILL one must ask; Why did they specifically ask for Victor? Then we tried to go in the back door, which was latched from the inside. The screen window to the right of the door was unfastened and the window was up. I climbed through the window by using a ladder, nearby – unlatched the door and Officer Bell came in with me. NOTE: According to Victor’s version of the story, the front door was unlocked when he got home and he just walked in: “The door was open, the front door.” The words came in a dreary monotone from the pale lips of the young man. “I might have known something . . . “ [10A] It is presumed that he just walked in, locked the front door and went straight to sleep in the 4th bedroom. We then went into the bath-room by opening door to same and found Victor Licata sitting in the chair with his hands to his head. We then asked him ‘what was the matter,’ and he did not answer. I went into the hall after the sister of Mrs. Licata had screamed and discovered there had been murder. Note that in this version of the story, the officers found Victor first and only then found the bodies. Once more, (in other chapters) we see that this part of the story varies a bit from teller to teller. I saw then in the rear bed-room, Mrs. Licata dead and her son, Phillip, 18, at her side in bed, still alive. I examined Mrs. Licata and found that she had been killed with some sharp instrument. Then I went into the center bed-room and found the daughter, Providence age 22 and the little son, Joe age 8 lying in bed apparently had been killed with the same instrument. Note the bedrooms in which the bodies were found. Mrs. Licata + Phillip in the rear bedroom. Here, note how culturally speaking, this version of the story makes more sense then others. For example, Providence was either 20 or 22 at the time, and it makes a lot more sense that she would be sharing her bedroom with an 8 as opposed to a 14 or 18 year old little brother. Then I proceeded to examine the front bedroom and found Mike Licata, the father lying there dead on the floor, who had fallen off the bed also killed with the same instrument. Much, much more about this statement in later chapters. Here just note how it contradicts the Inside Detective account of the chief Detective W.D. Bush. I instructed one of the relatives to call the Ambulance to send Phillip to hospital. Bell – during this time had the prisoner in his custody. Deputy sheriff Ben Watkins assisted Bell and they took the prisoner, Victor Licata to the county Jail. If you are a modern-day police officer, you are probably grinding your teeth over this. Simply put, while it was ok to send Phillip to the hospital, it was the rottenest idea to have removed all the evidence so quickly. Or was it? The following officers investigated: Sheriff’s Officer, City Officers, Bush, McMorris, Blanton, Mansfield, Dunn, Story, Beasley, Latture, Haskins, Vance & Bates. This actually should read; At least one of the following (above) police officers had to have had a hand in the conspiracy. HAD a hand in framing Victor Licata for the murders. In addition (not mentioned) the list should also include its author, Officer Bell, District attorney J. Rex Farrier, and head narc Frank S. Caston (who might have not physically been there at the time). The importance of all these matters will become very clear to the reader as we move along through this book. If there’s one thing that the average reader has figured out so far is that many of the reports/stories about Victor Licata are not just false, they are out and out lies. So how do we know that this Police Report is any different, nothing more than another bunch of lies, just another part of the cover up? After all wasn’t the “Black Legion” (an off shoot of the Ku Klax Klan) active within the Tampa Police Department at the time. [see chapter 8] Just look at the Joseph Shoemaker affair that would take place in 1935. And in truth, the author would not at all be surprised if one day, evidence to this effect were found. However, at the present time, it seems to be the most accurate (first hand) report that we have and the author believes that it contains the most truth and for the following reason. Death of Donald P. Scott Early on the morning of October 2, 1992, 31 officers from the Los Angeles County Sheriff's Department, Drug Enforcement Administration, Border Patrol, National Guard and Park Service entered the Scott's 200-acre ranch. They planned to arrest Scott for allegedly running a 4,000-plant marijuana plantation. When deputies broke down the door to Scott's house, Scott's wife would later tell reporters, she screamed, "Don't shoot me. Don't kill me." That brought Scott staggering out of the bedroom, blurry-eyed from a cataract operation—holding a .38 caliber Colt snub-nosed revolver over his head. When he emerged at the top of the stairs (note: this was a single-story residence), holding his gun over his head, the officers told him to lower the gun. As he did, they shot him to death. According to the official report, the gun was pointed at the officers when they shot him. . . . Despite a subsequent search of Scott's ranch using helicopters, dogs, searchers on foot, and a high-tech Jet Propulsion Laboratory device for detecting trace amounts of sinsemilla, no marijuana—or any other illegal drug—was found. Michael D. Bradbury, the District Attorney of Ventura County conducted an investigation into the raid and the aftermath, issuing a report on the events leading up to and on October 2, 1992. He concluded that asset forfeiture was a motive for the raid. QUESTION: Why didn’t the police simply plant drugs on the property? ANSWER: Under normal circumstances I suspect that that is what would have happened. However, here note shear number of officers from various law enforcement agencies involved. Making it (in effect) very hard if not impossible to coordinate any kind of cover up. You simply couldn’t trust the person next to you to go along with the story, etc. And the same thing can be said about the Licata case, there were just too many different agencies (Sheriffs Office, District Attorneys Office, Tampa PD, State Narcotics Dept., etc.) to coordinate a good cover up at this point. In addition the author must have been aware that ALL TOO many people were going to be looking at this report, etc. Thus (conspiracy or not) I have a tendency to believe (at least) most of this report as being accurate. At worst case, it constitutes the best most accurate (and yes truthful) account available to us today.